On the banks of the Allegheny River, Pittsburgh Pirates fans gather at PNC Park each year to watch their beloved Buccos, eat "Brunch Burgers" and discuss the legacy of Roberto Clemente. If you can't make it to the historic Steel City, the next best thing is the fan cave! Fill it with Pirates memorabilia with the help of custom Pittsburgh Pirates Personalized MLB Nameplate Wall Art. 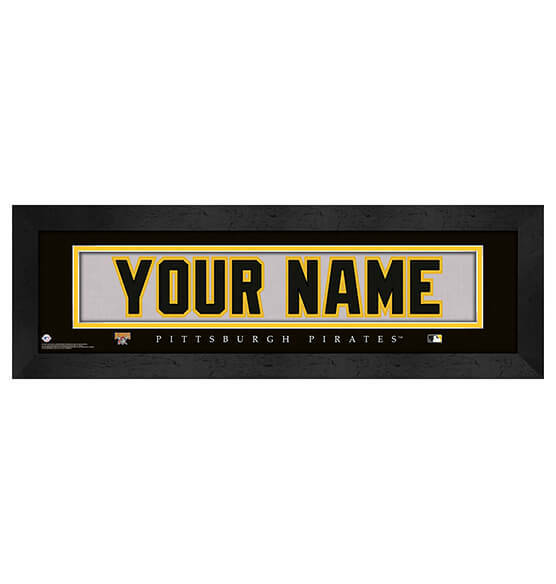 Customizable up to 12 characters and designed to look like the back of a Pirates jersey, this nameplate is just thing to knock your fan aesthetic out of the park. A sleek, black frame and its ready-to-hang sawtooth hanger make this a fantastic addition to your Pittsburgh Pirate collection.